The Ultimate Fighter 28 heavyweight tournament has come to a close with Juan Francisco Dieppa defeating Justin Frazier via armlock submission in the first round. In the the TUF 28 women’s featherweight tournament finale Macy Chiasson defeated Pannie Kianzad via rear-naked choke submission in the second round. 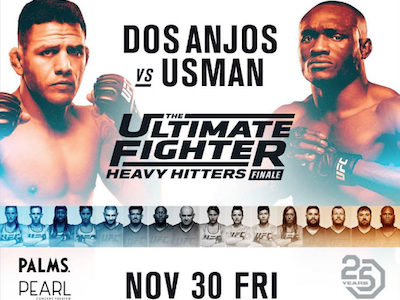 In the TUF 28 Finale main event Kamaru Usman won a dominant five-round decision over former lightweight champion Rafael dos Anjos. Full results and video highlights are below.